Compound creams are made with prescription drugs in powder form like this anti-inflammatory. 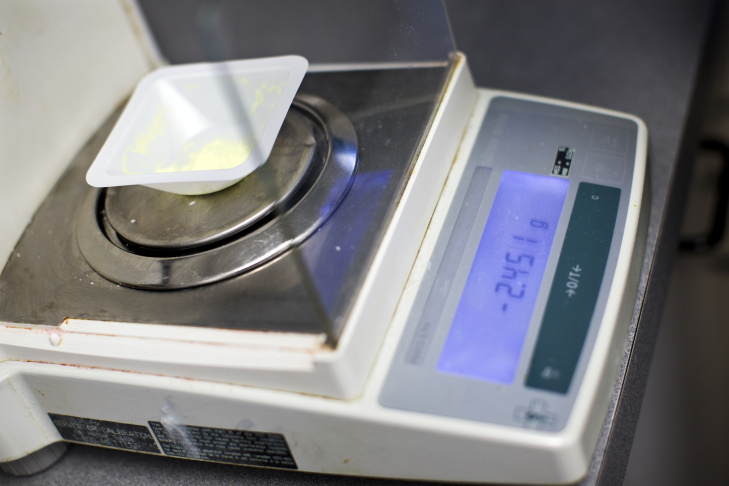 A pharmacist measures out each drug using a scale. A pharmacist then adds a solvent to the powdered drug, which solvent helps dissolve it. The solvent and powdered drugs are mixed together using a mortar and pestle. 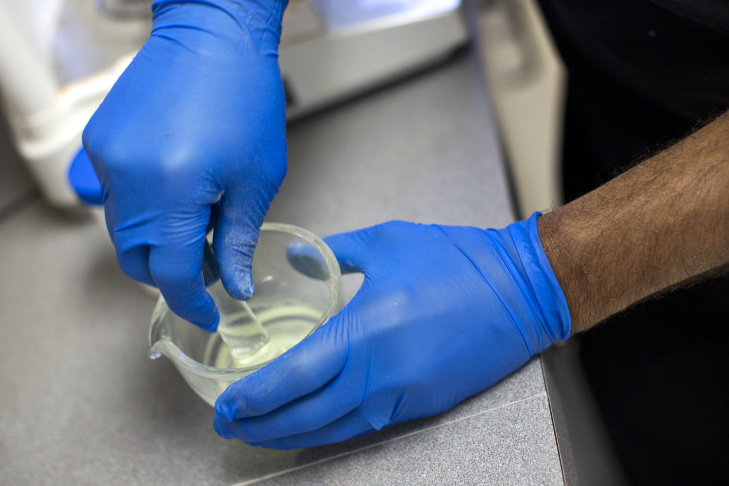 A transdermal cream base is added to the solvent and powder mixture. 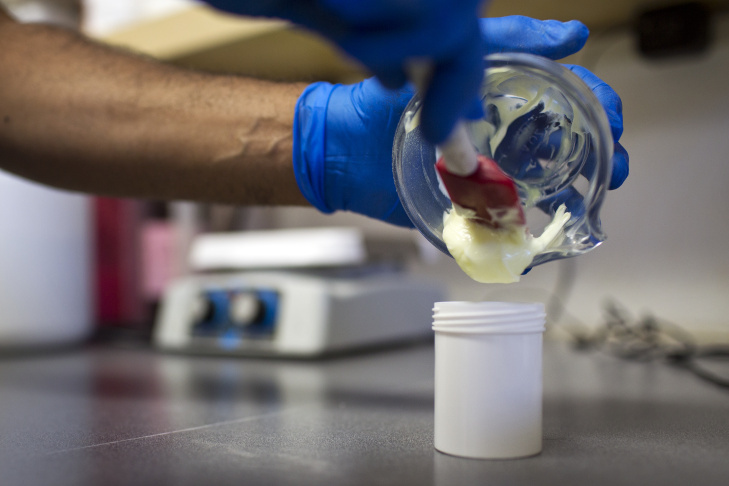 A pharmacist transfers the cream from a mortar to the prescription container. The compound cream is mixed even more using an electronic mortar and pestle. Finally, an ointment mill with a series of ceramic rollers further incorporate the powdered drug into the transdermal cream base. This is the first in a series of reports on the compound cream industry. You can read Part Two here and Part Three here. Los Angeles workers’ compensation attorney Steven Alves is reviewing a case on his desk, trying to figure out why a tube of pain cream costs more than a car payment. "There's a bill here that says $2,363 for one and here’s another one — just over $3,300. That's over $5,000 for this small amount of cream," said Alves. "It always makes you wonder, how could this be so expensive when other medications don't even come close to that?" Alves is talking about compound creams, one of the fastest growing pharmaceutical costs to California’s workers’ compensation system. 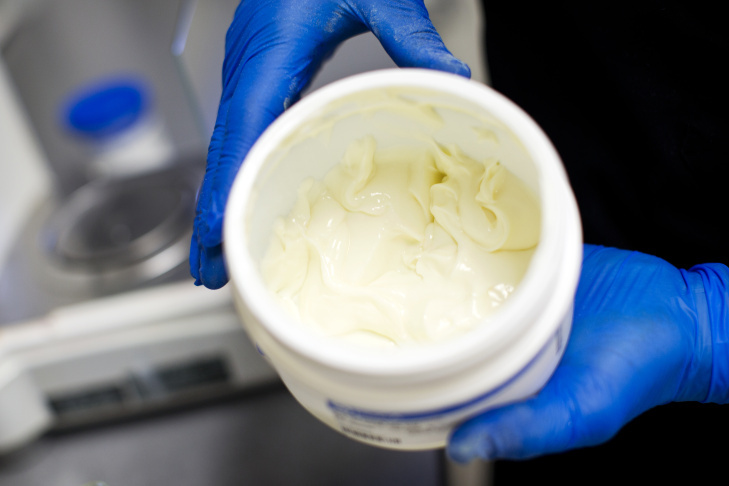 Workers’ compensation billings for compound creams have jumped exponentially in recent years. The price of many creams has jumped as well, an unexpected result of state legislation that was supposed to control costs. All of this has led industry watchers to question whether the high prices are justified. In fact, at least one firm that approves workers’ compensation claims has taken steps to combat the price inflation. And lawyers like Alves are going on the offensive. Alves represents employers in compensation disputes, who are picking up the tab for many of these creams. He said he’s seen more and more cases involving compound creams over the past five years. "It's definitely something that's a hot topic now" among employers, said Alves, adding, "especially when they have liability on such expensive creams." Compound creams originally were meant to be used as an alternative to a manufactured drug, typically for patients who can't take medication orally. But now they’re being marketed as an alternative for all kinds of pain management and other ailments. They’re intended for individual use, which means they do not require FDA approval. That also means they cannot legally be mass produced. The increased use of compound medicines goes far beyond Steven Alves' desk. In 2006, California’s workers’ compensation system was billed $10 million for compound creams, according to Alex Swedlow, a researcher with the California Workers’ Compensation Institute, which tracks the industry. 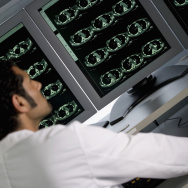 By 2013, Swedlow said, the amount had ballooned to $145 million – a 14-fold increase. The cost of individual compound creams has also risen sharply, after the California legislature passed a worker's compensation reform bill in 2012. Assembly Bill 378 attempted to curb the costs of compound creams by creating a pricing schedule for the ingredients, but that attempt seems to have backfired. The new law allowed pharmacists dealing with workers’ compensation cases to bill for each ingredient in a cream; before the law, they could only charge for the most expensive ingredient. Video: Why did compound creams get so expensive, so fast? Immediately after AB 378 became law, "the compound drug manufacturers increased the number of ingredients and increased the price point per ingredient," said Swedlow, noting that "the overall price … for a compound drug rose from about $460 to about $770." 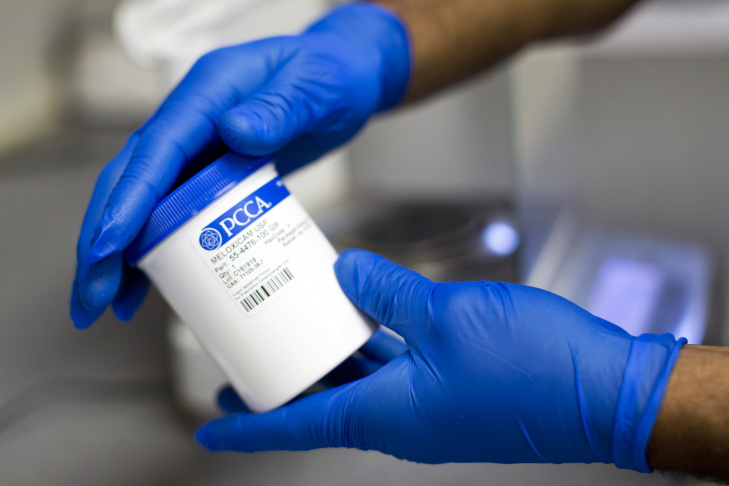 It's unclear how many of California's 7,000 pharmacies are engaged exclusively in compounding. California's Board of Pharmacy regulates pharmacies and does not differentiate between compounding and non-compounding establishments. California appears to have experienced some of the largest growth in compounding, according to Phil Walls, chief clinical and compliance officer with myMatrixx, a pharmaceutical management company in Florida. He has been tracking the growth of compound cream use and blames a change in California's prescription fee schedule, which allowed doctors and pharmacists to get reimbursed at a higher rate when prescribing the creams. 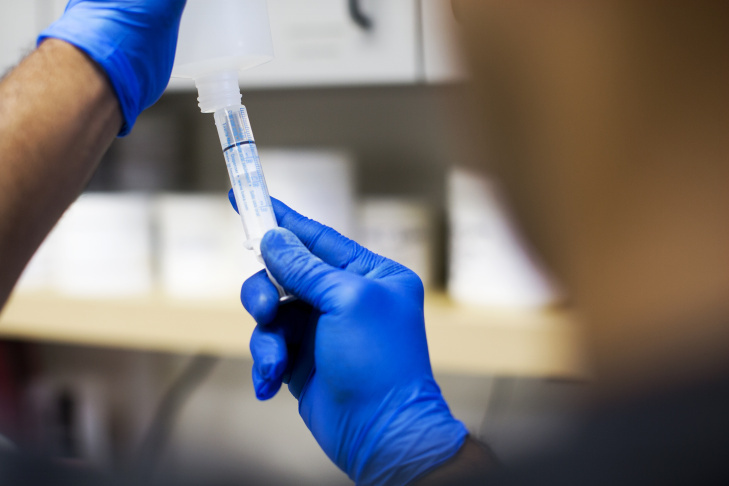 "Quite frankly they were able to make significant profits off of these medications," and that prompted a lot of pharmacists to switch from traditional medications to compounding, said Walls. "Compounding has since spread basically throughout the country," he added. "I don’t think there's any state that's been immune to it." 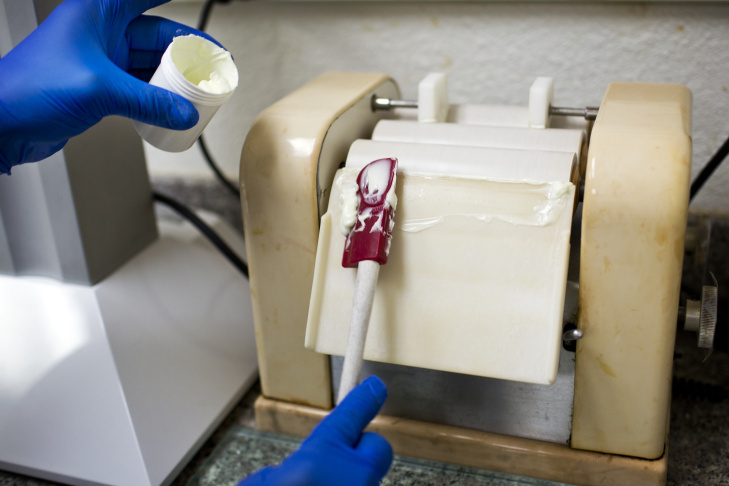 Compound creams are predominantly seen in workers’ compensation cases, according to Walls. That’s because other systems — such as Medicare — have built-in cost controls such as deductibles and preauthorizations for medications, and workers’ compensation doesn’t, he said. That makes it "very easy" to say, "Oh, for this particular injured employee, he or she needs this compound," said Walls, "and that sort of opens the doors to … misuse of the system." Worker's compensation is a form of insurance coverage for injured workers. Employers — be they private or government — pay for the costs of treatment by being self-insured or having an insurance policy. So escalating costs in the government sector are borne by taxpayers, while private firms pay the price of higher costs in the for-profit sector. 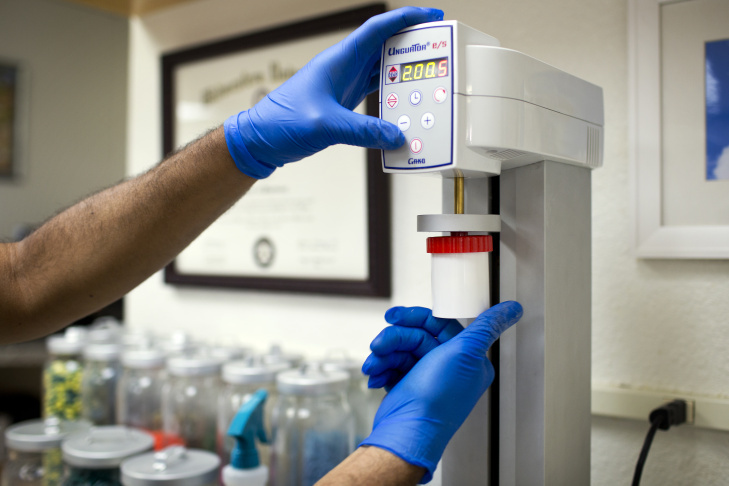 Yorba Linda compound pharmacist Mark Gonzalez has witnessed the growth of the compounding industry. When he opened up his compounding pharmacy in 1999, Gonzalez was the only one in Orange County. "Our first month of business," Gonzalez recalled, "we only filled 11 prescriptions." An Internet search shows there are dozens of compounders in Orange County today. Compounding has become so big, one pharmacist took out a patent for a compounding business on wheels, so the drugs can be made in a doctor's parking lot. "I have heard of creams up into the $14,000 range," said Gonzalez, who added he has never submitted a bill for a cream that costly. He also doesn't deal with workers’ compensation cases. Fourteen-thousand-dollar creams are not typical, but $1,000 creams are, according to Brian Henry, vice president of Express Scripts, the country's largest pharmacy benefit manager. Express Scripts manages workers’ compensation claims for firms and government agencies with a total of 90 million workers nationwide, including L.A. County’s 100,000 employees. "The average cost of a compound prescription has gone up from $90 in 2012 to about $1,100 today," said Henry. Henry blames the increase in part on bulk manufacturers who are putting unnecessary ingredients in the creams and overcharging for them. "We've seen that the past two years, there are over 100 — 117 to be exact – specific compound ingredients that have increased in cost by 100 percent. Out of that, another 13 have increased by 1,000 percent," according to Henry. The price inflation has provoked some pushback. Express Scripts announced in July it will no longer reimburse for about 1,000 ingredients in compound creams, calling it an extraordinary but necessary move to control costs. "I don't know if eliminating 1,000 drugs is the best move because in the end the patients do suffer," said compounding pharmacist Gonzalez. 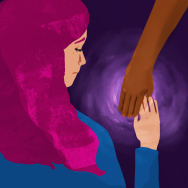 "I have one patient right now … [who] is unable to get her medications because her hormone therapy is one of the 1,000 chemical eliminated from the reimbursement list," said Gonzalez. The marketing and prescribing of compound creams to treat an ever wider variety of problems is a positive development, said Gus Bassani, Chief Executive officer of Texas-based Professional Compounding Centers of America, which produces the chemicals sold to pharmacies. 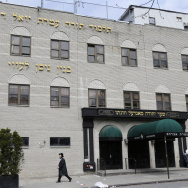 He ascribes compounding’s growth to its use as an alternative to traditional medications. "It has seen a bit more of a resurgence lately but I think it's because people are a little bit more attuned to the individual needs of patients, and compounding provides that particular solution," said Bassani. "Compounding provides a valuable solution for patients,” he maintained, “and just not in the pain arena but in the arena of pediatrics and autism and other areas where patients may not be getting benefit from a commercially available option." This story was updated Sept. 10, 2014.